For the first five or so minutes of Beware of Pity, it feels like a train hurtling past you. Several actors are sharing the narrative, speaking (in German) into microphones, their dialogue intercutting at times, as the surtitles flash past in a relatively small space on the back wall. Your senses are on high alert as you try to follow who is saying what. And then suddenly you are attuned, enveloped by the words and the inventive staging, and swept up in an intense, compelling production. 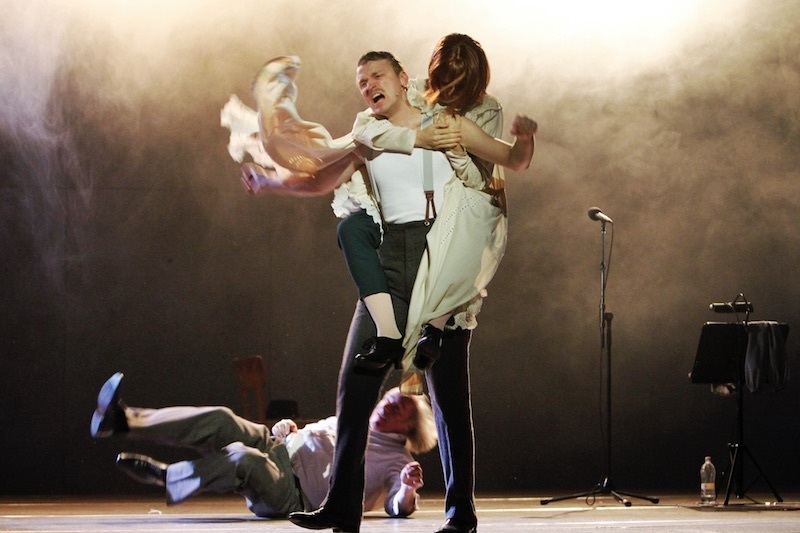 Beware of Pity is the first production that Simon McBurney, Director of renowned British theatre company Complicité, has created for the equally groundbreaking German company Schaubühne Berlin. It was a huge hit when it premiered in Berlin in 2015 and had a successful season in London in 2017. Now it is being given an exclusive Australian season in Sydney as part of Sydney Festival. The play is based on the 1939 novel Ungeduld des Herzens or Beware of Pity by Stefan Zweig, an Austrian Jewish writer who wrote the book while a refugee in London. The story begins just before the start of World War II as Anton Hofmiller (Christoph Gawenda) looks back to a life-changing incident in 1914 when as a young Austrian lieutenant (Laurenz Laufenberg) he was stationed on the Hungarian border. Invited one night for dinner at the castle of the rich, Jewish Baron Kekefalva (Robert Beyer) – whose story is later revealed – Hofmiller is having an unexpectedly good time until he invites the Baron’s daughter Edith (Marie Burchard) to dance. Surprised when she goes pale and backs away from him, he discovers that she is lame. Mortified, he leaves but the next day sends her roses to apologise. She invites him to tea and soon Hofmiller finds himself visiting daily to chat with Edith and her cousin Ilona (Eva Meckbach). Before he knows it, he is caught up in a relationship over which he has no control, for while he feels pity for her, Edith has fallen passionately in love with him and is furious when she discovers he only feels pity. Confused, embarrassed, full of self-loathing, and taunted by his military colleagues that he is just after Edith’s money, Hofmiller not only fails to extricate himself from the situation but makes things progressively worse, with tragic results, leaving eventually to fight in World War I where he becomes a hero. Set in Europe as it lurches towards war and chaos, the production explores ideas to do with compassion, pity as a poison, and courage often being as much to do with weakness as heroism. Directed by McBurney, the production is adapted by McBurney with his co-director James Yeatman, Maja Zade and the ensemble of seven actors. Anna Fleischle’s striking, non-naturalistic set design is stark and bold with a few tables and chairs, microphones which the actors use for dialogue and some foley effects, and a glass cabinet at the back which resembles a display case in a museum. In it hangs an old uniform which the young Hofmiller puts on as the story flashes back to 1914. 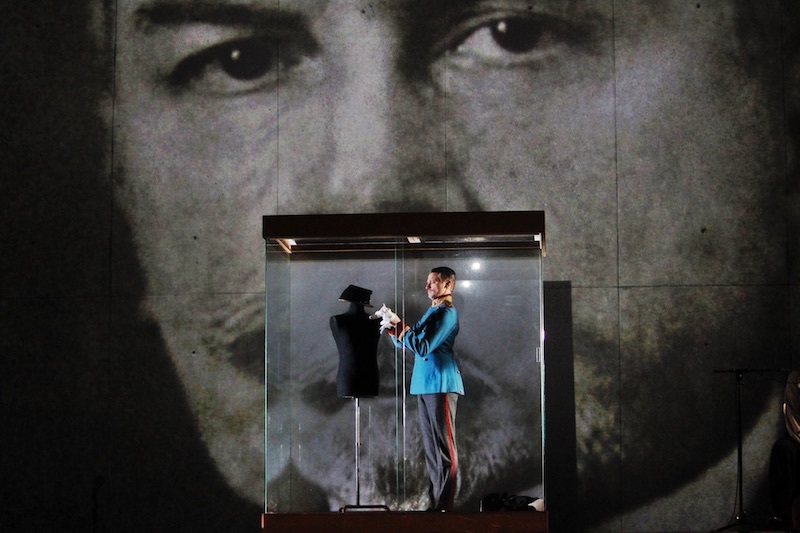 The cabinet – which can be be moved across the back wall – is brilliantly used as different spaces, with projections shown inside it ranging from the blood-splattered jacket of the assassinated Archduke Ferdinand, to a dancing ballerina (to contrast with Edith’s crippled movement and longing to dance), to the interior of a train, to battlefields. Projections are also shown at times on the back wall, including close-ups of faces and hands. Edith, meanwhile, is wheeled around on a chair or a table. Holly Waddington’s costuming is relatively simple but highly effective, with Edith draping a slightly creepy, long white dress over her body at times, while Paul Anderson’s stunning lighting and Pete Malkin’s sound design, heighten the intensity of the drama and the ominous feeling of inexorable disaster. While Laufenberg plays only the young Hofmiller, and voices his own dialogue, the other actors share the narration, play various roles and sometimes voice the dialogue while others mouth it; Meckbach, who plays Ilona among others, sometimes voices dialogue for Edith, which Burchard lip-syncs, for example. The overall effect is of the excellent, fine-tuned ensemble (which also includes Moritz Gottwald) telling the story together, but also showing it to us as Hofmiller sees and hears it. Although, initially, the staging looks and feels as if the production will take a cerebral approach, it is in fact an intensely realised, highly emotional experience, keeping you on the edge of your seat. At the end, as blood soaks Hofmiller’s jacket and seeps out of the bottom of the glass cabinet, a series of images in the cabinet hurtle through World Wars I and II and up to the present with shots of refugees in boats: a chilling reminder that the world is once again moving towards catastrophe.